There is no such thing as a business that has no customers. No customers means that you are not operating a business — it is just a hobby. The sad reality is that there are a ton of businesses with no customers, or just barely enough that keeps their doors open. This is a terrible position to be in if you call yourself an entrepreneur. There is no person who became a business owner to just struggle — you might as well have remained an employee to do that. If your business is struggling to find customers, your problem is your marketing. Businesses who invest in their marketing keep a steady flow of leads coming into their business. From there, they have the opportunity to convert these interested individuals into customers. But this is only accomplished by having a well-designed marketing strategy that helps guide your marketing activities. If you are in need of effective marketing activities to implement into your marketing strategy, the following tips listed will prove helpful in producing great marketing results. Marketing is a process that requires consistent effort. You cannot market one day, take off for the remainder of the week, and expect to produce results. Marketing requires consistency in order for consumers to begin identifying your company with a specific product or service. The businesses that stay promoting their products and services are the ones that experience consistent growth. For your marketing to work, you will need to invest in its ability to reach people. You do not need to have an enormous budget to get results, but that does not mean be super cheap. Set a budget that will allow you to effectively engage the target audience your business is focused on. The problem many entrepreneurs have when it comes to marketing is not setting specific goals. Without having goals in place, you do things that serve no purpose. Take the time to write out your goals and reinforce them with initiatives that will help your goals come into fruition. Frequently review your progression so you know if your initiatives are producing the planned results. When ideas pop into your head, write them down so that you do not forget them. This allows you to explore different options in order to maximize your marketing results. Therefore, if one or more activities are not working, you can implement new ideas that may produce results better than the ones you are currently experiencing. Your business cards are a very important piece of marketing real estate that should never be out of your reach. You never know when an opportunity will present itself that could lead to a new customer by having your information ready to give to a prospect. Your business card should state exactly what you do and have clear contact information. When your business cards begin to run low, immediately order more before they run out. So many business owners have missed out on great opportunities because they did not have any business cards available to hand out. Whenever you are out at a networking event, trade show, business seminar, or conference; you should wear a nametag that allows people to quickly know your name and your company’s name. This helps you stand out, which makes it easier for people to remember you. This is what great marketing does, it helps you stand out from those who blend in with the crowd. Nothing ever stays the same in the market you operate within. There will be new developments that occur which will affect how your business must market itself. You need to stay up-to-date about this information so that you are never caught off guard, and scrambling to make the necessary changes. You must understand your business thoroughly in order to understand how to implement the best marketing practices. Your business is dependent on many different factors outside of you. When you know how each of these factor work, you can develop a marketing plan that effectively communicates the value produced from your business. Your competition will provide you with the key information on how to effectively communicate with your target. Look for examples from both underperforming businesses and those that are very successful. Analyzing businesses in all spectrums will help you understand what works and what does not work. You then know what to focus on in order to produce the best results for your marketing. Your customers should always be the source you refer to when you want to analyze the performance of your business. You need to understand why they hired you, what were their expectations, and if you met or failed their expectations. Learning this information will help you drastically improve your business, which will work to enhance your marketing message. Customers that left you will provide you with honest feedback of where your weaknesses occur. Use the information they provide to understand what customers want your business to provide for them. This will help you gain more clients and retain their patronage long-term. One of the best ways to expand your business is by expanding into new markets. When you expand, you will need to use new marketing concepts in order to effectively communicate with your new target market. You will learn different marketing approaches, which helps you become a better marketer — knowing what works best for a particular industry or demographic. Email list usually provides valuable information about the industry your business operates in. They tend to include tips about how to gain more clients, how to keep your clients, and how to make more money from your clients. All great information you need in order to operate a business that consistently grows. When you develop something new, it gives your existing customers a reason to spend more money with your business. It also helps to attract new customers who can be enticed into paying for existing products or services as a packaged deal. The best way to serve as many customers as possible is by offering tiered pricing. This allows you to have customers on the high-end, low-end, and in-between. Therefore, you will never be scrambling for customers because you are not focused on just serving one market segmentation. When you offer high-end products and services, you allow yourself to make more money without having to serve a lot of clients to do so. Clients who are willing to pay a premium price want more focus on their needs and will pay high amounts to retain your services if your business provides the value they want. Your business can always be improved, so must never become content. Constantly evaluate your services in comparison with your competition. Ask your customers how they believe your services can be approved. Be on the forefront of coming changes within your industry. Surrounding businesses are not your competitors. They are actually a great source for referrals because they operate in the same community you serve. Since you will be operating completely different businesses that do not compete with one another, you are able to send customers to one another’s businesses. This helps you because a customer is more willing to try the services of another business that has been recommended by a business owner they trust. Your employees are on the inside of your business, working its functions and having constant contact with your customers. Due to what they see on a daily basis, they can provide suggestions that increase productivity and customer satisfaction. Marketing seminars provide insight from an expert who has produced great results in the marketing field. You can implement the information they provide into your own business in order to see if you can produce better marketing results. Seminars are also a great place to network with other business owners who can refer customers to your business. Reading helps to expand your mind and learn about new marketing concepts you have not thought about yourself. These books will also teach you how to think like a consumer and communicate in an effective way to convert their interest into a paying customer. Marketing is always evolving since there are so many ways you can market your products and services. Therefore, you must remain up-to-date about the changes that occurring so that you can increase your marketing conversion rates. 23. Train your employees, clients, and colleagues to promote referrals. Marketing should be a never-ending act, so those people who have contact with your business should be promoting your business. Your employees, customers, and colleagues know at least one person who could use your services. Incentivize them promote your business by offering them referral payments for their referrals who become customers. It takes the constant evaluation and strategic planning to develop a marketing strategy that produces great results. Ask the opinions of others who participate in your marketing activities or their own. Their feedback can help you devise a marketing strategy that helps your business gain the desired attention in the marketplace. People within the same industry as you, have the experience and knowledge about how to operate a successful business and how to attract customers. Learn as much as you can from these individuals so that you can master both your business’s marketing and performance. More and more consumers are doing online searches in order to learn about a business through their own research. You want your business’s website to effectively communicate the value of your products or services, and give prospects a clear way to contact you for further information. It also does not help to just have a business website in today’s world. Your website needs to be optimized to effectively engage prospects and convert them into customers. 27. Create a signature for your email messages that includes your business’s contact information. As email has become a way for people to communicate, your email should include all the information to contact your business. This should include your business’s phone number, website, and social media accounts. Give people as much information as possible so that they can contact you through the form of communication they are most comfortable with. 28. Provide testimonials from customers in your literature. You can speak highly of your business all day, but prospects want to hear from your current customers how great your services really are. By including testimonials, you are showing prospects that you have helped other individuals or businesses implement solutions that have proved successful. Everybody gets mail in white envelopes which they tend to associate with bills or junk mail. When you send your information in unique packaging, you entice people to want to open your mail and read the contents that are inside. You want to entice people to strongly consider your business as a provider for their particular needs. Therefore you want to make them an offer they cannot refuse. Give prospects a free sampling of your business, so that they will be strongly tempted to further experience the value of your services by becoming a customer. 31. Update your media list often so that press releases are sent to the right media outlets. You need for your business to be publicized as often as possible. This is done by having a contact list of media personnel and forming solid relationships with these people. You want them to give your business key exposure so that people will inquire about your business’s products or services. 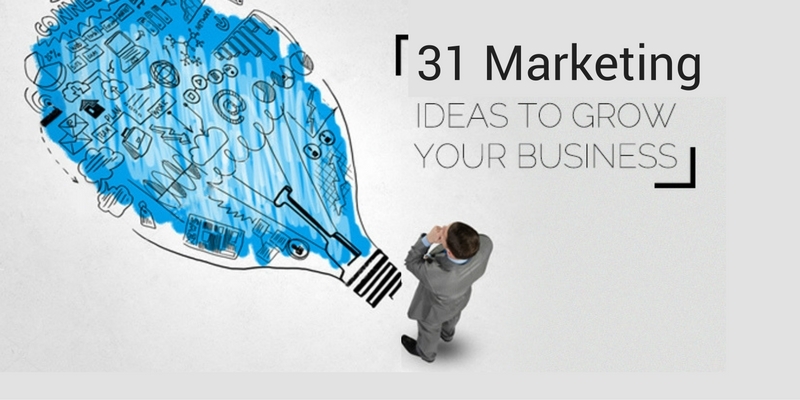 You have been provided with 31 great marketing ideas to grow your business. Take these ideas and implement them into your marketing plan in order to produce better results with your marketing. You will learn that just doing basic marketing provides little traction. It is when you create a combination of activities, that your marketing begins to produce a stronger performance. That is exactly what you want — marketing that puts more eyes on your business. Having an Idea? Looking for Singapore Company Incorporation services?